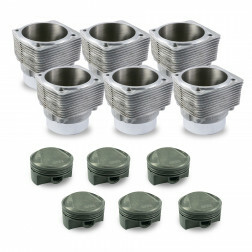 Mahle Motorsports + Nickies™ piston and cylinders kits allow for tighter clearances, reduced wear on both the piston and bore, and quiet operation, providing true compatibility with no compromises. 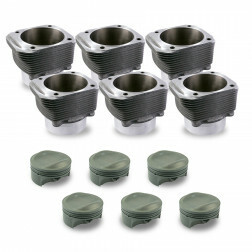 Through this partnership, NLA sets are being reintroduced in response to customer demands, designed specifically for Porsche® air-cooled engines featuring Mahle Motorsports custom 2618-forged alloy pistons matching Nickies™ Cylinders. 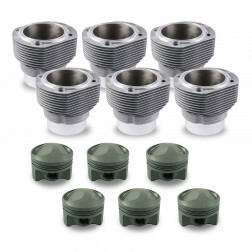 Mahle Motorsport designs incorporate larger valve reliefs for bigger valves and performance camshafts, as-advertised compression ratios, and unmatched performance and durability in an aftermarket piston, exceeding OEM requirements. Mahle Motorsports pistons are coated first with a phosphate dry film to protect the pin bores from galling and from micro-welding in the ring grooves. Next, MAHLE's proprietary anti-friction Grafal® coating is applied to the 2618 alloy true slipper skirt forgings adding cushioning that reduces noise and wear on the piston and bore. MAHLE performance rings are the most extensive and technically advanced high performance rings in the industry. 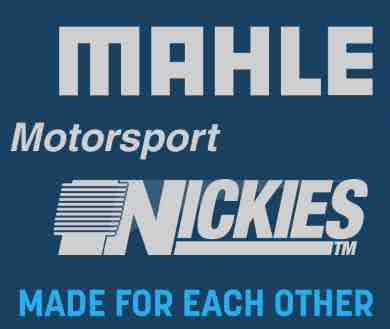 Driven by today's requirements for reduced oil consumption, lower friction, higher power output, and longer life, MAHLE is out front with the latest technology.